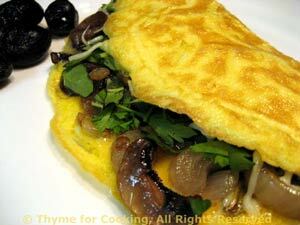 Wild Mushroom Omelet, autumnal first course from Thyme for Cooking. A sure sign of fall is when we start seeing cars parked along the sides of the roads, their owners gathering and/or selling wild mushrooms. Use any type that appeals to you, wild or cultivated, a variety if possible. With scissors, snip herbs, divide in 2 and set aside. Clean mushrooms (using brush - do NOT wash) and roughly chop. Finely chop shallots, mince garlic. Heat 2 tsp oil in medium nonstick skillet. Add shallots and sauté for 3 minutes. Add mushrooms and garlic and continue to sauté until mushrooms start to brown, 7 - 10 minutes. In a medium bowl beat 2 eggs well with a wire whisk. Add half of the remaining oil. Add eggs and swirl around to cover bottom of pan. Sprinkle with half of the herbs. When the eggs are almost set put half of the mushrooms on 1/2 of omelet, and, with a spatula, turn the other half over. Leave it in the pan for another 20 - 30 seconds to finish cooking, then remove to a plate. Can be put into 250F (125C) oven to keep warm while you make the other omelet... or just cover with a lid. Oh yes - repeat for second omelet. Serve, garnished with a few olives if you have them.